Armenians may not have been the world's first onion eaters, but we are probably the most enthusiastic. It's hard to imagine an Armenian meal without onions as an ingredient. Really, it's common to find onions in every dish on a fully laden Armenian table -- and plenty more sizzling on the stove waiting to take their place. To me, the smell of onions frying has always signaled that dinner is on the way, although it never held a clue to the menu because you can start almost any Armenian recipe with, "Saute one onion..."
ancestors were either very lucky or possessed an uncanny instinct for choosing healthy ingredients. Everyone knows by now that red wine is believed to be beneficial to the heart, but do you know why? Researchers say it's because of something called quercetin, a flavonoid compound also found in tea, apples -- and onions. In fact, one study showed that eating a modest serving of onion actually gave arteries the biggest anti-inflammatory boost. According to the National Onion Association, onions also have properties that can lower blood pressure and cholesterol, and protect against cataracts and stomach ulcers. They're also low in calories, high in Vitamin C, and fat free. Wild onions are native to Armenia and the surrounding region. My father said travelers who carried a pouch of dry bulgur could enjoy a fine dinner by adding a bit of water from a stream and plucking a few wild onions from a hillside. Scallions were an essential part of the mezze plate whenever Dad and his chums got down to the serious business of drinking and listening to the songs of the Old Country. As a kid, I was no more interested in those spicy green stalks than I was in that weird music or those drinks that smelled like medicine. As an adult, I'm pleased to report that I've managed to acquire a taste for all three. This blog made me laugh out loud! So true! So true! Check '60 Minutes' tonight....2/28/10. They are featuring a segment on Armenians. 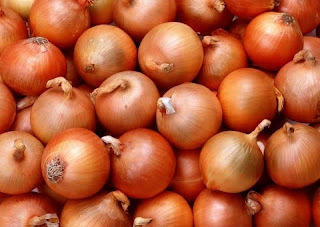 Not only are they beneficial if you eat them, onions are also antibacterial! My roommate from neighboring Azerbaijan leaves a cut onion out on the table if any one has a cold, as he claims "it takes the germs out of the air". Onion juice mixed with honey was also used by the ancient Egyptians and Romans as an antiseptic, like an old-fashioned homemade Neosporin! How very interesting! This I did not know. I was just thinking to myself this morning as I made a few lent dishes.....wow I use allot of onions and then stumbled upon this. Very true....Onions are awesome! An Armenian cooks BFF. If you are unsure about someones skill or passion for Armenian cooking....just ask them how they feel about onions. If they say they LOVE onions....you know they are a good cook! Wonderful website! Thank you! Thank you so much! Around here, onions are a part of just about every meal.